Residents of the No. 30 Village/ Trafalgar area in West Berbice are frustrated with the stagnant floodwater and are pleading with the government to release the $50M it would cost to fix two vital pumps. 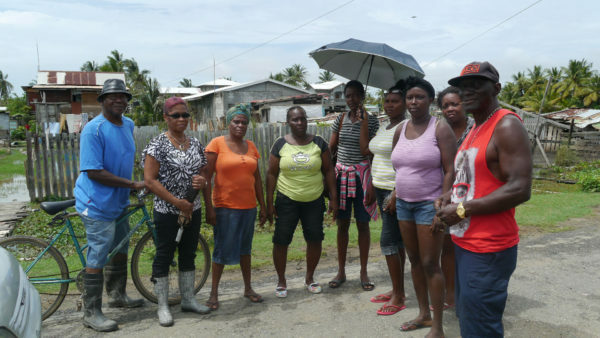 The residents who have suffered losses to their livestock and are becoming sick, staged protest actions on Monday, blocking the road and demanding that they be compensated. Most of the residents in the area rear livestock for a living. 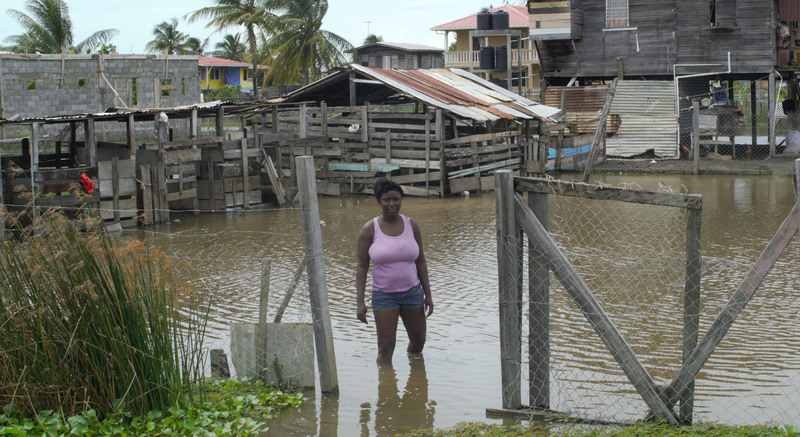 The residents said too that the Guyana Water Inc “disconnected the pipes and open the main and dirty water getting in.” This, they said, is causing everyone, especially the children to contract vomiting, diarrhoea and skin infections. They told Stabroek News (SN) yesterday that they were not looking for foodstuff but want monetary compensation, lamenting that government was not seeing the seriousness of their plight. 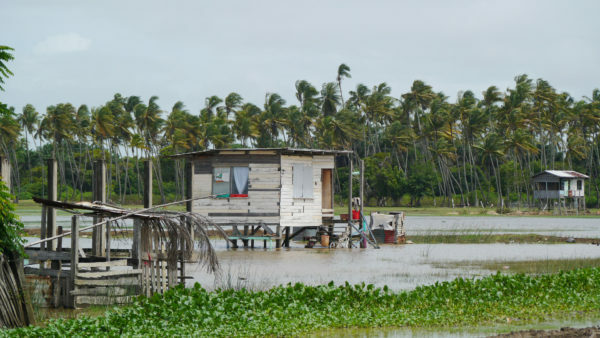 They had also asked for the intervention of the Minister of Public Infra-structure, David Patterson and had taken reports to the Regional Democratic Council of Region 5. Two families, with children, that were living in flat houses have had to relocate to relatives’ home to escape the stagnant water in theirs. He said they were affected by flooding since April and that the water would just recede for a little and rise again whenever it rains. Robin said the Trafalgar pumps were vandalized two years ago and no effort was made to fix it. 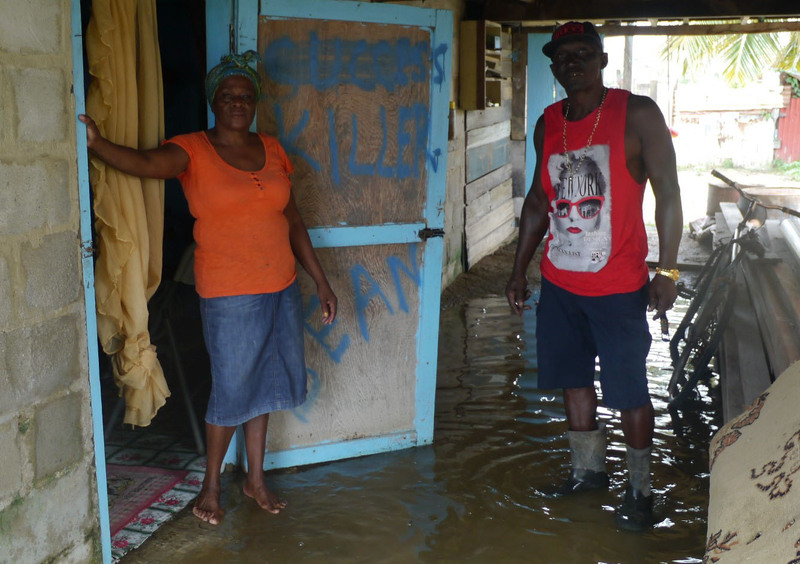 George Robin and his wife, Elsie standing in the stagnant floodwaters under their house. He also blames the situation on what he said was the negligence of the Mahaica, Mahaicony, Abary-Agricultural Development Authority (MMA-ADA), saying that for the past 10 years they have been suffering from flooding. Again, he has lost three young sheep and some of his fowls. “From the time sheep and goat walk in water, their foot get soft and they die,” he lamented. In addition, his wife, Elsie Robin said they have “crawling insects” going up in their home and their daughter, a trainee nurse was stung by a centipede. The woman said they killed it and also killed another one that was going into her son’s apartment in the lower flat. 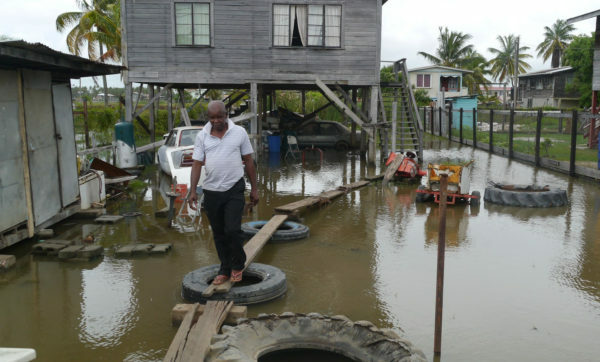 His furniture and carpet were also destroyed in the floodwaters. Over at No 29 Village, Glendon Blair’s mechanic shop as well as two of his cars were under water. Apart from not being able to work since the flood started, he was distressed about the damage that must have been done to his cars, especially to the “computer box” and the expenses he would incur to fix it. Luckily he managed to raise one of the cars to prevent water from getting in. Colin Miller and Forbes Williams who have suffered losses to their livestock, said that the channel needs to be dug and the pump needs to be replaced. 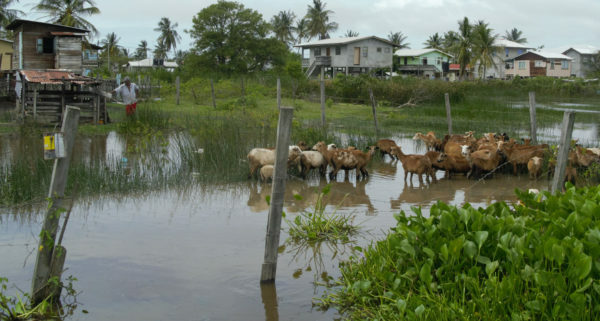 Patsy Fraser said she has to keep her sheep and goats locked up because she “can’t lose them because they drink the dirty water and they’re dying.” Her pit latrine is also under water. A short distance away, Raymond Roopnarine was looking at his sheep in the water, wondering what to do with them. He told this newspaper that three small ones have already died. He would usually send them in the backdam to graze and said some were missing. Across the street, Hansraj Ramsuchan said his livestock was also “catching cold and the sheep head swelling and about six died. All me ducks and fowls die out.” He was advised to give them antibiotic injections. She said that seven of her sheep have died as well as all of her ducks while a few fowls have so far survived. A young resident, Ritchie Paul was distressed over the loss of 80 Creole baby chicks that he had “hatched” to sell for $500 each. He also lost five lambs and some fowls. 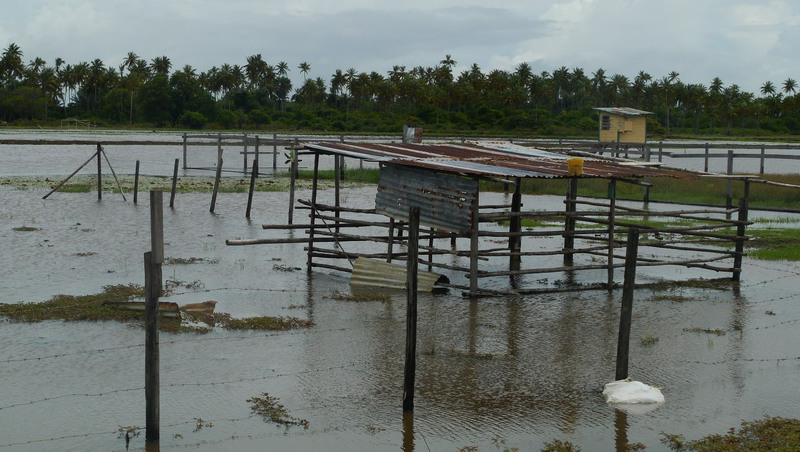 Meanwhile, residents said that a teacher from the playschool in the village fell into the water because she missed the bridge, which was submerged.